The two women, Lydia Gurley from Galway and Lydia Boylan from Dublin, join a small and very exclusive club of Irish big-hitters to medal at a major championships. 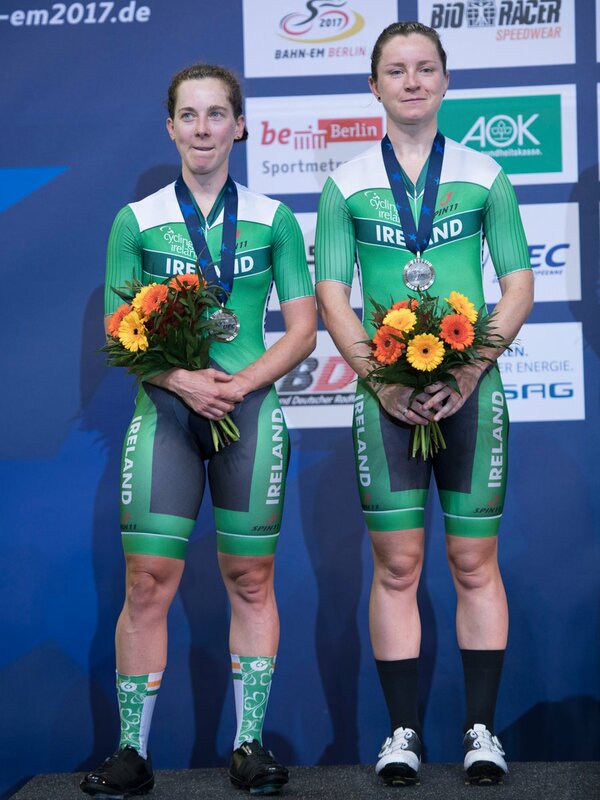 The stars of the Irish camp in Berlin tonight at the close of the European Track Championships, Lydia Boylan and Lydia Gurley have expressed their delight with winning sliver. The Dublin-Galway combination very nearly came away with the title. However, Britain pipped them at the last and so silver it was for the Irish. But both were rightly thrilled after their medal ceremony. They gained two laps on the field, though Great Britain’s Elinor Barker and Eleanor Dickinson took the last sprint and the gold. Dutch multiple world and European champion Kirsten Wild with her partner Amy Pieters were 3rd. “It hasn’t quite sunk in,” said Boylan, “It’s my fourth elite Europeans. I train really hard every year, and finally it all came together. Gurley was also thrilled, saying Boylan was the right woman to be in the heat of battle with. “I’m really proud of what we achieved today. It was an awesome team effort. We work really well together. “I’m still in disbelief – it means so much to us – and that it’s a team medal as well. “It means so much more than an individual medal. We always work really hard, and it’s worth it. Of the race itself, Boylan said it took her and Gurley and while to settle into it. “We haven’t raced since the Worlds, so we didn’t have any expectations,” she explained. “We didn’t panic, and after 20 laps we got to the front of the group – we were watching moves, and watching David. “Then we got into the group that got a lap, and then we took another one. “We were up there and racing – we were in the race, not just chasing like we were doing at the Worlds last year. “We are proving to ourselves we are strong enough to compete. Boylan also finished 8th in the omnium yesterday and said getting back into action again today was a challenge. “It was tough to get into race mode again today, after a long day of racing yesterday – but it all came together,” she said. Gurley agreed that it took a while to get going, but she did not believe the race ever got away from them. “We stayed calm, and knew it would take a bit to settle – we haven’t raced in six months,” she said of riding the Madison, a new event in the Olympics. “When we got to the front of the group we were more comfortable there. We positioned ourselves well, and we were strong enough and smart enough to do that. “We got into a group of three that got a lap, and then just waited. It was a hard race, and then David told me to go again. “I was in pain, but everyone else was in more pain. We just worked really hard and picked up the extra lap. “We were well positioned, our changes were good, our timing was a bit off, but we didn’t miss any changes. If you miss one, it’s game over. “The last sprint was just so fast – there wasn’t a lot we could do. But if you told me this morning that we would get silver, I wouldn’t have believed you. “Ultimately, we are two strong riders, and that’s good. Technically we can get better, and we have three more races coming up in the next few weeks, and racing is the best training you can do. “It was incredible to stand on the podium. It made every session worth it; every single day we work hard was worth it. 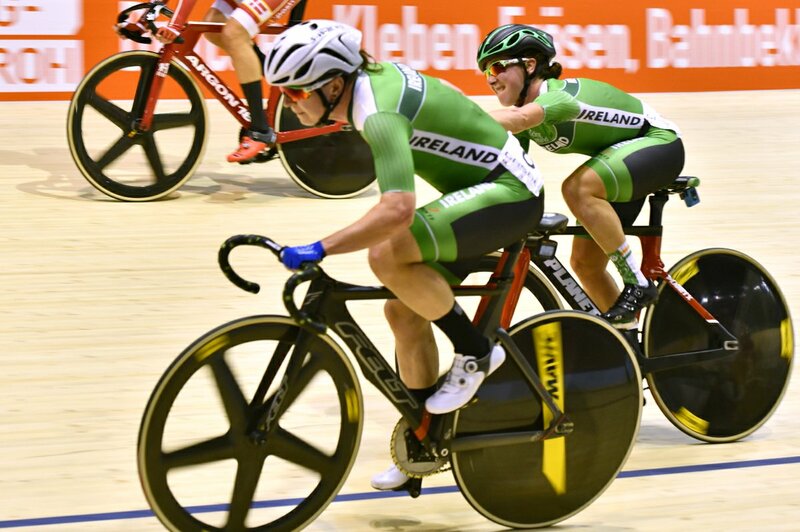 In the men’s madison Mark Downey and Felix English finished in seventh place after an aggressive performance. Robyn Stewart was 18th in the sprint with a time of 11.460.